Helping you look the way you feel as you conquer life's adventures. Seattle plastic surgeon, Dr. Austin Hayes, is a board-certified plastic surgeon who specializes in cosmetic surgery of the breasts and body. His goal is for YOU to have a great experience from the first visit until your last check-up. He focuses on natural breast augmentation results, provided in a safe and relaxing atmosphere. Dr. Hayes received his M.D. degree from Columbia University, in New York City. He graduated with AOA honors, which is an awards that only the top 10% receives. He trained at the University of Washington, one of the foremost programs in the United States for comprehensive care of adults and children. He then completed a hand and microsurgery fellowship at The Curtis National Hand center. Dr. Hayes performs microsurgical breast reconstruction for women who have undergone mastectomy after breast cancer. Finally, he went on to train under several of the country’s most prominent cosmetic surgeons. Dr. Hayes was one of only a handful of doctors in Washington chosen as a realself Top 100 doctor. This award represents his dedication to sharing his expertise and shows his commitment to education and positive patient outcomes for YOU here in our office! He has offices in Seattle Washington and Portland Oregon, which serve patients from all parts of Washington and Oregon. For cosmetic & plastic surgery in Seattle, Washington call (206) 624-9113 today. 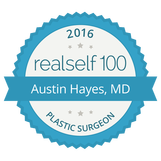 Dr. Austin Hayes is one of only a few doctors in Washington to receive the realself 100 award for 2016. The surgery: Reshapes and lifts your breasts to give a youthful appearance. The Surgery: A breast lift combined with an implant reshapes breasts that are sagging gives beautiful fullness.